DK tension: 25sts/33 rows to 10cm on 4mm needles. 4ply tension 29sts/38 rows to 10cm on 3.25mm needles. Bonnet, mitts and bootees, (DK or 4 ply): 50g each. DK matinee coat: 31-41cm 100g, 46-51cm 150g. 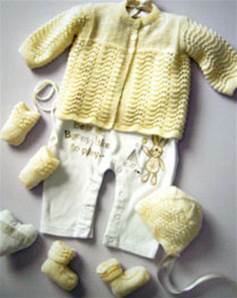 4 ply matinee coat: 31-46cm 100g, 51cm 150g.